Joining the select club of US, Europe, Russia and China, India now has the capability of Deck Landing fighter aircrafts. 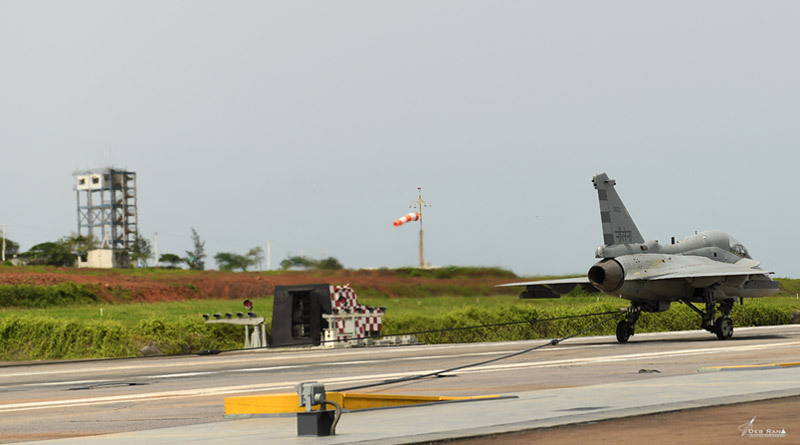 Capt Shivnath Dahiya piloted the LCA Naval Prototype 2 (NP2) and safely executed the first contact of the arrestor hook system with Arresting wire at moderate taxi-in speeds on location at the Shore Based Test Facility, INS Hansa, Goa. The first successful Taxi-in engagement was monitored closely by the Landing Signal Officer Cmde J A Maolankar and Test director Gp Capt A Kabadwal (retd). “This is the first of a series of engagement planned at proving the arrestor hook capability,” said CMD-HAL, T. Suvarna Raju. HAL’s design wing, Aircraft Research and Design Centre (ARDC) has designed and developed the Arrestor Hook System (AHS) for Ship Deck operations of LCA Naval version. This AHS has been successfully integrated with the LCA Naval Prototype 2. Having verified in-air operation of Arrestor Hook System in Bengaluru on 23 July 2018, the aircraft has been operating at INS Hansa Goa, since 28 July 2018. Carrier Compatibility trials (CCT) of Naval Aircraft are slated to be carried out at shore-based test facilities, built at Indian Naval Base Goa. The CCT involves completion of extensive shore-based trials before embarking on actual deck and is the stepping stone towards completion of CCT trials of LCA Navy. Teams of HAL, ADA, CEMILAC, RDAQA, Navy and NFTC have worked synergistically to achieve this flawless result.